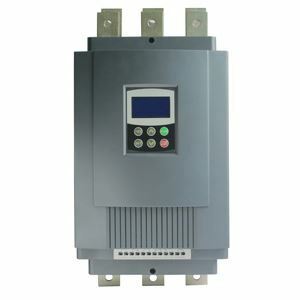 60 hp soft starter, 45 kW three phase 220v, 400v, 480v, 660v AC motor starter. Model GS2-045 (220v), GS3-045 (400v), GS4-045 (480v), GS6-045 (660v). It is important when specifying a soft start motor controller that one takes into account the effect on the generator. Use of a soft starter will reduce the starting kilovoltamps (kVA) required of the generator, meaning that one can use a smaller generator than one would with an "across the line" "hard start" induction motor controller. HOWEVER, because of the harmonic currents drawn by the soft start controller, the generator's alternator must be larger than the starting kVA would typically suggest. The bottom line is that soft starters are good ideas but make sure your generator technicalist knows about them.